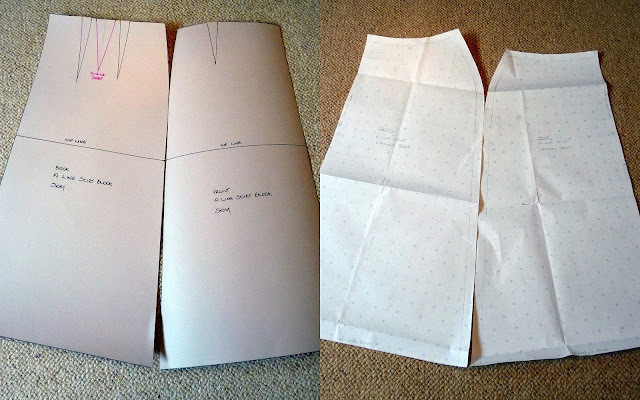 I've mentioned a couple of times recently that I went on a pattern drafting workshop a few weeks ago. It was the first of what I hope will be several more, and we started off by making a skirt block. 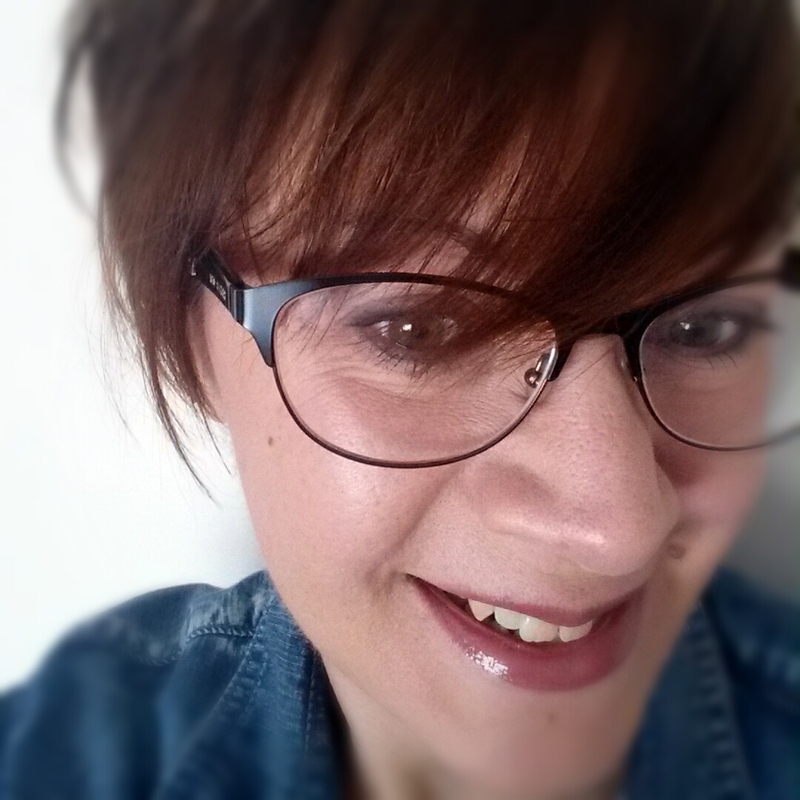 I always have trouble getting skirts - particularly straighter styles - to fit me well, as I have a big difference between my hip and waist measurements, so I was really keen to be able to draft a block that actually fitted me. For reference, on the day we took our measurements my waist was 78cm and my hips 111. As you can see, a difference of 33cm - just over 13 inches. I was quite surprised to be working in metric measurements - I never do, except for my 15mm seam allowances! - but it's quite liberating. I've no idea what the metric measurements equate to in imperial, and I'm not really that keen on doing the conversion to find out. We started by drafting a block once our measurements had been taken, which we then made up in muslin. The basic block is really a close fitting pencil type skirt with no ease. 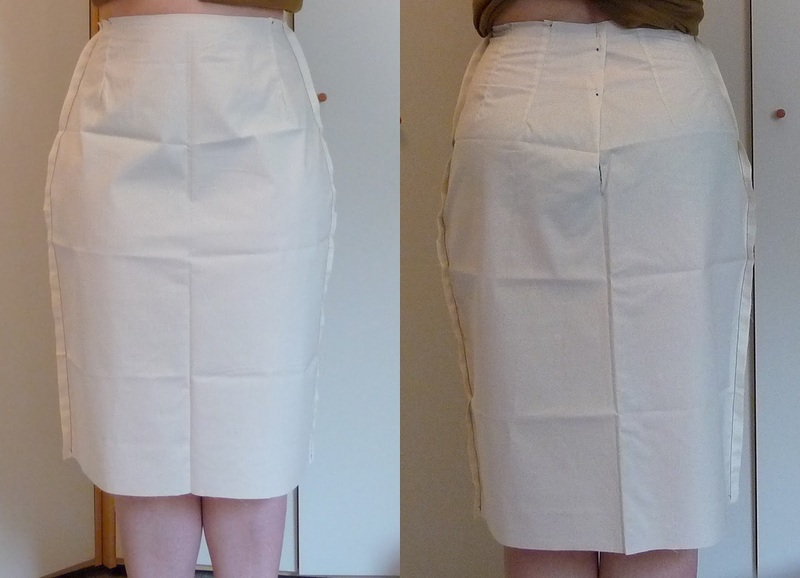 Mine fitted perfectly straight away, which never happens when I try to make a skirt from a commercial pattern. Not the most flattering of photographs, but hopefully you can see that my straight skirt block fits pretty well. Then we went on to make an A-line block, and then doing a bit of dart manipulation to remove the darts from the A-line block completely. This is where things got really interesting. Looking at the shape of my dartless A-line pattern I was convinced that it wouldn't fit me. Our tutor told me it would. This is my A-line dartless block. As you can see, it doesn't fit. Above is the dartless A-line block, which I made up in muslin this afternoon out of curiosity. As you can see, it doesn't fit. There are "empty" lumps of fabric between my hips and waist. In the centre photo you can see where I've tried to pin them out, but I don't think this would really work very well. I wonder if it's because I have such a large difference between my waist and hip measurements that this block doesn't work for me? I'm not that bothered to be honest, because I don't mind using darts to get the shaping I need. I thought it might be useful to compare the two A-line blocks, so I laid them on top of each other. The darted one is a proper block, with no seam allowances while the dartless one underneath does have seam allowances. Comparing the two blocks side by side you can also see the differences in the length of the side seams. The darted block has side seams that are within a couple of millimetres of being the same length. The dartless block has side seams that are 35mm longer on the back than the front. When sewing the muslin up I had to ease this in. I wonder if that contributed to the empty spaces above my hips? Perhaps I drafted it incorrectly, although I don't think I did. I thoroughly enjoyed the workshop and am looking forward to using what I've learned to experiment with drafting a skirt for myself. I'm also hoping to do a follow up workshop later in the year with the same tutor where we'll learn more about altering our basic blocks. Have you tried drafting your own patterns, or would you rather stick to commercial/independent patterns that are already drafted for you? Drafting trousers is something I'd really like to be able to do, I have such trouble with fit on trousers. that is incredible, being able to see how they are different, even though they are both A line! Just goes to show how different cuts can affect the fit, since we are all a bit different. I know! I think the dartless one would probably work better on a less curvy body shape. It will be interesting to see what Lydia makes of your dartless A-line skirt. I wouldn't give up on it as there will be a simple solution, I am sure. There probably is! I'm not too bothered though, I don't mind the darts. I'll be interested to know if there is a simple solution, too. The darted one looks great. I made a skirt block several years ago and made many, many skirts from it. But now I'd have to start over since my measurements aren't the same anymore. If I find a simple solution I'll let you know! I'm really happy with the darted one, and actually I think the dartless one looks a bit weird without the darts - I suppose it's not what I'm used to seeing. Such an interesting comparison! It really illustrates the need for darts in curvier figures like ours. I purchased a couple of Craftsy classes on drafting (bodice and skirt) and I'm planning on watching them and working up my blocks this fall. I know, I definitely need darts! I was convinced that the dartless block wouldn't work for me, and the tutor kept saying it would. I have both those Craftsy classes in my library and have actually watched the skirt block one. It's pretty good, and the skirt block is quite straightforward to draft. Make sure you get someone to help you take your measurements.